There’s an old joke that goes like this: at the international tournament for secret intelligence services they play a game to determine which is the best agency. They let a rabbit loose in a forest and the agency that captures the rabbit in the shortest period of time wins the competition. The German secret service retrieved the rabbit in half an hour. They were acting on a tip from a neighbor that thought the rabbit was behaving strangely because he didn't put his recycling in the correct bin. The French secret service located the rabbit in an hour. The rabbit was baking with some potatoes and garlic at 180 degrees having been caught by a local chef. The Swedish secret service caught the rabbit in two hours. They had to release him however because one of the agents used a gender-specific noun to address him and thus violated his human rights according to Swedish law. MI6 apprehend the rabbit in three hours using CCTV footage. But it takes 12 years to send the rabbit back to his country and costs taxpayers six million pounds. The Russian secret service destroys the entire forests and kills all the rabbits within a few hours. A friend of Putin buys the forest very cheaply and turns it into a private resort. The Syrian secret service team comes back three days later with a cat. Under torture the cat confessed to being a rabbit. 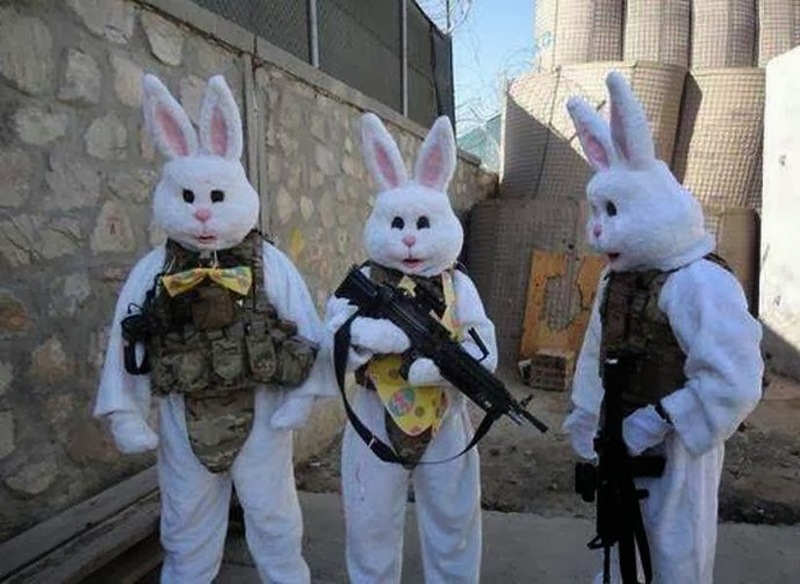 The Egyptian secret service arrests all the rabbits in the forest and announces they are part of a conspiracy to undermine Egyptian national sentiments. They also arrest five sharks, four hens and three doves alleging they are Mossad agents. And a partridge in a pear tree. The Mossad sends in a team of highly-trained professionals to assassinate the rabbit but they kill an elephant instead. A simple mistake to make. Evidence emerges later that the elephant had made anti-Semitic remarks in public. The CIA decides on a quick plan of action and gets congress to approve a 230-million-dollar ‘Errant Rabbit Apprehension and Neutralization Program’ within six weeks. The ground operation contract is awarded to a private security firm leading its shares to increase in value by 40%. A sustained campaign of drone attacks is launched over the forest severely restricting the ability of renegade rabbits to operate freely. Doubts start to emerge about the program when evidence surfaces of the wrong rabbits being targeted but the CIA responds that ‘all rabbits look the same’ and the program has a better than 51% accuracy hit rate. A year later, the rabbit hasn't been apprehended yet and random attacks on rabbits in the US increase in frequency. Rabbits are declared to be incompatible with the American way of life. The CIA comes up with another plan to fund a rival group of rabbits to help apprehend the rabbit. This time the CIA claims it can tell bad rabbits from good rabbits but the public is skeptical. The ‘War on Rabbits’ becomes a constant feature of American politics. Meanwhile, the news that the American team had been disqualified and that the Germans were announced the winners receives very little attention in the US mainstream media.